It’s been about a year since Google Analytics launched Real Time reports. At first, they were cool to look at but provided seemingly limited functionality and actionable insights. One of the few examples of usefulness was measuring the immediate impact to your site from social media activities. – tracking down traffic sources. If you think visits may be showing up as Direct when they should be showing up as Referral visits, for instance, you can use Real Time reports to do some detective work. How do visits from Google organic show up in GA when the user is on an iPhone running iOS 6? Does it change if they use the built in search bar in Safari vs. navigating to Google and doing the search there? This is an issue that came up shortly after Apple launched its latest mobile operating system update. As it turns out, searches done using the built in search bar show up as Direct, while searches done from Google.com in Safari show up as Google / organic. Even more noteworthy is that even if the user is logged in to a Google account, we get to see the keyword they used – as opposed to the (not provided) that has plagued us for more almost a year now. For the purpose of diagnosing traffic sources, go to your Real Time reports (Home > Real Time > Traffic Sources). Then, in a different browser (or from your phone or tablet), go to your site using the method in question. For example, if you want to see how Google organic visits will show up for logged in users, go to Google, log in, and do a search for your brand. Then click on your listing, and monitor your Real Time reports to see how it shows up. Real Time reports ignore any filters you have on your profile. UPDATE: Real Time reports now obey any filters applied to your view (profile). This update was rolled out in October 2012. Real Time reports are most helpful with diagnosing mobile visits. For desktop/laptop visits, you can use the HttpFox Firefox plugin or the Developer Tools for Chrome to troubleshoot. For sites with heavy traffic, you’ll need to be able to segment out your visit from the hundreds or thousands of other visits currently on your site. To do this, visit your site using whichever method you’re investigating. Then, tack on a query parameter to the end of the URL and load the page. For example, if you first land on example.com/page.html, change the URL to be example.com/page.html?testing=fun and load the page. Then go to the Content reports in Real Time and search for active pages that include testing=fun. Now you can go to the other reports in Real Time (i.e. 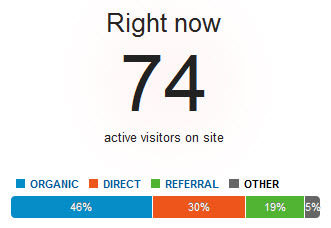 Traffic Sources) and it will show the data just for that active page. Do you think Realtime Reports are a useful feature, or a worthless gimmick? Let us know in the comments.